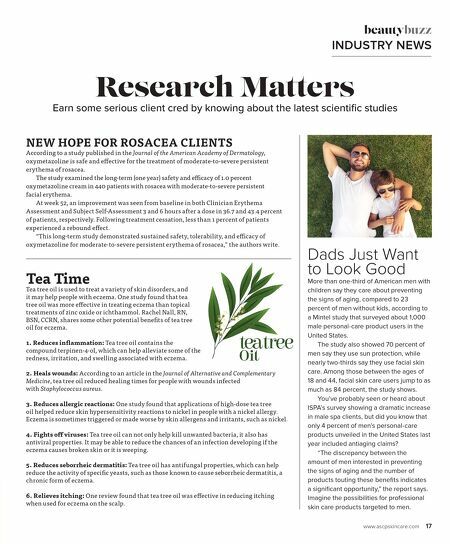 www.ascpskincare.com 17 beautybuzz INDUSTRY NEWS Research Maers Earn some serious client cred by knowing about the latest scientific studies Tea Time Tea tree oil is used to treat a variety of skin disorders, and it may help people with eczema. One study found that tea tree oil was more effective in treating eczema than topical treatments of zinc oxide or ichthammol. Rachel Nall, RN, BSN, CCRN, shares some other potential benefits of tea tree oil for eczema. 1. Reduces inflammation: Tea tree oil contains the compound terpinen-4-ol, which can help alleviate some of the redness, irritation, and swelling associated with eczema. 2. Heals wounds: According to an article in the Journal of Alternative and Complementary Medicine, tea tree oil reduced healing times for people with wounds infected with Staphylococcus aureus. 3. Reduces allergic reactions: One study found that applications of high-dose tea tree oil helped reduce skin hypersensitivity reactions to nickel in people with a nickel allergy. Eczema is sometimes triggered or made worse by skin allergens and irritants, such as nickel. 4. Fights off viruses: Tea tree oil can not only help kill unwanted bacteria, it also has antiviral properties. It may be able to reduce the chances of an infection developing if the eczema causes broken skin or it is weeping. 5. Reduces seborrheic dermatitis: Tea tree oil has antifungal properties, which can help reduce the activity of specific yeasts, such as those known to cause seborrheic dermatitis, a chronic form of eczema. 6. Relieves itching: One review found that tea tree oil was effective in reducing itching when used for eczema on the scalp. NEW HOPE FOR ROSACEA CLIENTS According to a study published in the Journal of the American Academy of Dermatology, oxymetazoline is safe and effective for the treatment of moderate-to-severe persistent erythema of rosacea. The study examined the long-term (one year) safety and efficacy of 1.0 percent oxymetazoline cream in 440 patients with rosacea with moderate-to-severe persistent facial erythema. At week 52, an improvement was seen from baseline in both Clinician Erythema Assessment and Subject Self-Assessment 3 and 6 hours after a dose in 36.7 and 43.4 percent of patients, respectively. Following treatment cessation, less than 1 percent of patients experienced a rebound effect. "This long-term study demonstrated sustained safety, tolerability, and efficacy of oxymetazoline for moderate-to-severe persistent erythema of rosacea," the authors write. Dads Just Want to Look Good More than one-third of American men with children say they care about preventing the signs of aging, compared to 23 percent of men without kids, according to a Mintel study that surveyed about 1,000 male personal-care product users in the United States. The study also showed 70 percent of men say they use sun protection, while nearly two-thirds say they use facial skin care. Among those between the ages of 18 and 44, facial skin care users jump to as much as 84 percent, the study shows. 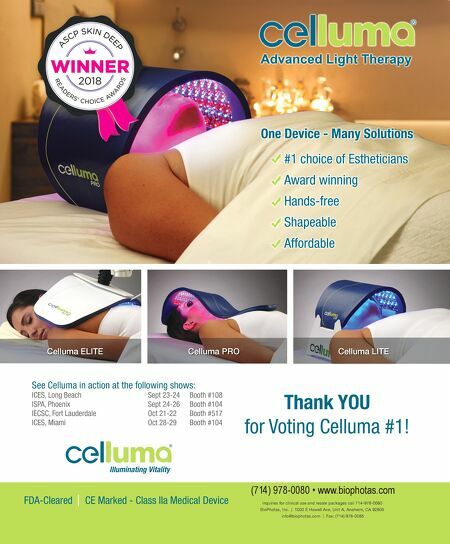 You've probably seen or heard about ISPA's survey showing a dramatic increase in male spa clients, but did you know that only 4 percent of men's personal-care products unveiled in the United States last year included antiaging claims? "The discrepancy between the amount of men interested in preventing the signs of aging and the number of products touting these benefi ts indicates a signifi cant opportunity," the report says. Imagine the possibilities for professional skin care products targeted to men.